​The mayors—Woody Washam in Cornelius, Rusty Knox in Davidson and John Aneralla in Huntersville—show signs of cooperating on issues ranging from development to affordable housing, from I-77 to education. Their opinions, especially when they are in concert, are heard loud and clear by political leaders in Raleigh and Charlotte. 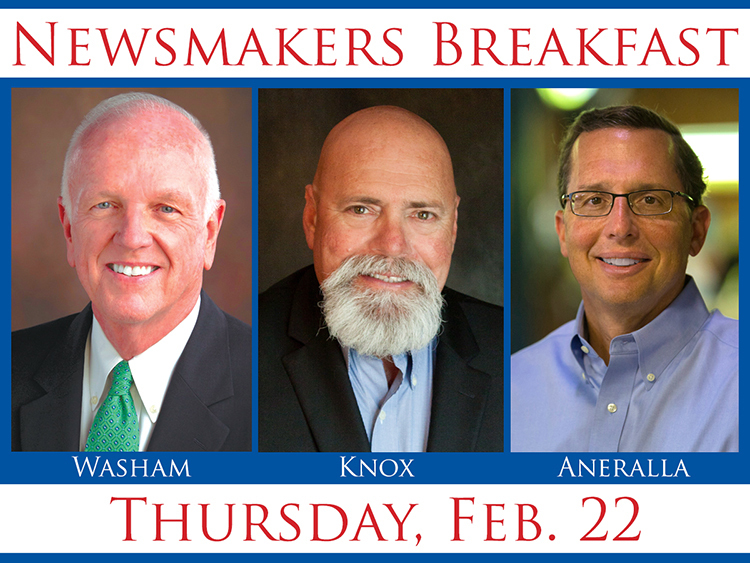 Newsmakers Breakfasts are open-forum Q&As, driven by current issues and news around us. Anyone can ask a question. Doors open at 7:15 a.m. for networking. The buffet-style breakfast gets under way at 7:30 a.m. The Q&A begins at 8 a.m. and concludes at 9 a.m. The cost to attend, $12, includes a full country breakfast. Reservations are required. RSVP at 704-895-1335 with Visa or MasterCard. McIntosh Law Firm is the Presenting Sponsor, The Breakfast Sponsors are Realtor Dixie Dean and Raymer Kepner Funeral Home. Coffee Sponsors are Davidson Wealth Management, G Brokerage and Charlotte Insurance.